Today I’m asking my University of Georgia magazine writing class to write an in-class review, using all five senses. The review will be very short — 140 characters (not words, but letters, counting spaces), to be precise, or the maximum length of a tweet or text message, or the average Facebook post. 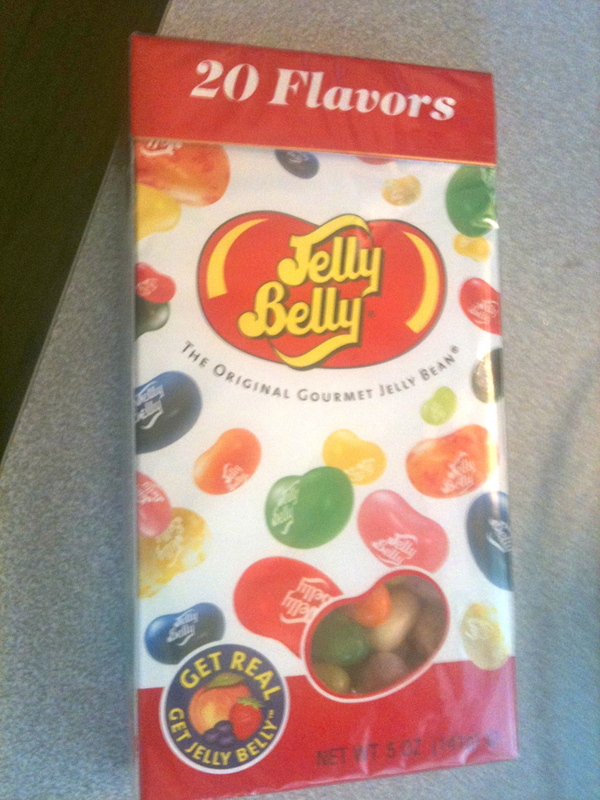 Fortunately, the subject matter is also small: A single Jelly Belly gourmet jelly bean, in all its exotica. They are allowed to use any abbreviations or slang commonly used on Twitter, Facebook, IMs or other social media/online chat rooms. However, they need to get their points across so that these users can easily understand them. And: They need to craft interesting, accurate descriptions. Creativity counts. I wanted them to post here so they could all read one another’s reviews. They will have a few minutes at the end of class to complete the assignment, so it’s a tight deadline too. On your mark, get set… tweet! Had to pop out that poop freckled pasty egg of stale Dollar General popcorn like a dog refusing medicine. The pastel yellow jellybean tastes like a heart attack with an overwhelming taste of butter that leaves remnants of salt in my teeth. in an eraser size ball. and it is gone much too soon. but sharp to the taste. Waxy & smooth in my fingers, the gritty sugar of the grass green Jelly Belly still lingers on my molars. Tastes more blue raspberry to me. The round bean reflects a soft glow against the pink tinge filled w/ lemony sugar that oozes over the firm, crisp layer on the 1st bite. I’m in Chicago in December, nose numb and fingers burning cold, inhaling warmth from a cinnamon latte that smells like my mom’s kitchen. tomato red cinammon jellybelly takes me to oct. when weather is perfect & i walk down milledge to the church that sells all the pumpkins. The forest green bean-shaped candy with hints of pinkish-red speckles brought me back to bitting into a juicy slice of watermelon on a hot summer day in the middle of July. Crunch, crunch, squish. I’m tempted to keep chewing. This little buddy didn’t come whirling around and around a red machine though. Orange Jelly Bellies⎯an orthodontist’s nightmare. So tart and gooey. Humid as a summer’s night, sweet like cotton candy. Not worth a visit in that dredded chair.